Slurry mixing tank process has never been easier if you are using Pulsair. 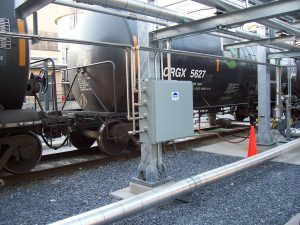 Re-blending and re-agitating settled solids and slurries in rail tank cars is fast and easy with these advanced blending solutions. The process works by pulsing in large bursts of compressed air into the rail tank car through the bottom discharge valve. There are no moving parts inside the tank and the TM-2013 is all-pneumatic and can operate on either compressed air or inert gases without modification. Pulsair can uniformly suspend the heavy settled solids and reduce any heels that might otherwise form without agitation. The process is proven to work on high solid slurries such as magnesium hydroxide, titanium dioxide, calcium carbonate, clay and lime slurries. The “bottom-up” vertical mixing process is more energy efficient than inefficient air spargers and mechanical mixing. Fastest solution to re-agitate and re-blend high solids that have settled out in rail tank cars. Proven technology for past 30+ years.